Advertiser.ie - What's going on in your area? 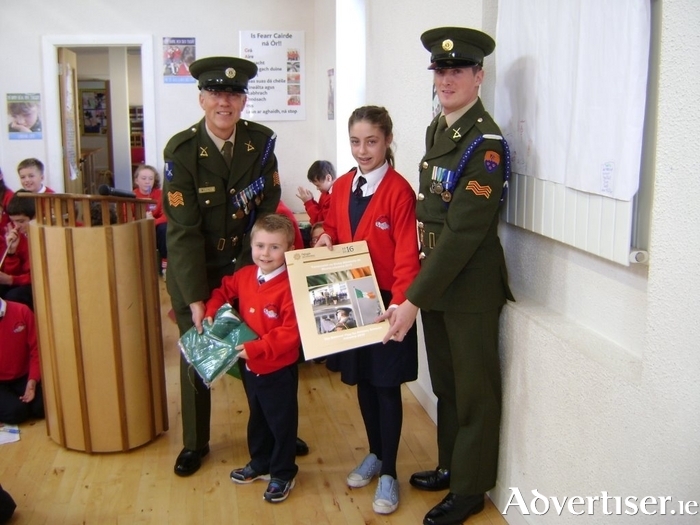 Sergeant PJ Maloney and Corporal Des Padden present the Irish Flag and Proclamation at Gaelscoil na Cruaiche, Westport, to students Cóilín Ó Conghaile and Niamh Ní Sheacháin. A support group meeting for people living with arthritis and fibromyalgia will take place on Wednesday, October 28 at 8pm in TF Royal Hotel, Castlebar. This months guest speaker will be a Chiropractor. If you have any questions regarding the meeting please do not hesitate to contact the organisation at [email protected]. Edinburgh Wollen Mills at Horkan's Garden Centre in Turlough will be holindg a bring back day in aid of Enable Ireland on Friday, October 30. The event will run from 9.30am to 6pm, there will be a raffle on the day and 20 per cent off all Autumn and Winter stock. Mayo Roscommon Hospice in association with An Garda Siochana Safety Awareness Exhibition is hosting a coffee/tea day at Breaffy Sports Arena on Saturday October 31 from 11am to 4pm. There will be exhibitors covering-security-lights/doors, elderly response pendants, road safety, and lots more. Numerous community service stands include farm safety, first aid demonstrations, etc. The event will be fun for all the family, meet the emergency services including the Garda air support unit, canine unit, mounted unit, regional support unit, Mayo Fire Service who will have their engines and support vehicles on display, and much more. Entry is free, with donations to hospice palliative care much appreciated. The Castlebar Markets resume at the Tennis Club on Friday next October 30. The markets will run from 9am to 2pm with a special Halloween party taking place. Go along and enjoy the wide variety of food, arts and crafts, plus teas and coffees. Bring the children for Holloween treats and face painting. A great morning for all the family. For more information call (087 ) 162217. Fahy National School board of management will be holding a fundraising 25 Card Drive in aid of the school in Fahy NS on Sunday November 22 at 8pm. The Mayo County Board of Comhaltas Ceoltóirí Éireann are to honour the Mayo prizewinners from Fleadh Cheoil na hÉireann 2015 at a special function to be held in the Park Hotel, Kiltimagh, on Saturday November 14. This is the ninth year that Coiste Mhaigh Eo of CCÉ have honoured their prizewinners and the function is now one of the highlights of the Comhaltas calendar in Mayo. The function is open to everybody and tickets can be had by contacting your local branch of Comhaltas or any of the officers of Coiste Mhaigh Eo of CCÉ. Tickets, which are €20 each, can also be had from Marion Lyons (087 ) 2482417 or Helen Duggan on (086 ) 3343002. A six week evening course with Learning To Exhale starts in Foxford on Tuesday November 3. For more information call Suzanne on (087 ) 192 9067. Next Mayo stroke support group meeting is on Thursday October 29.The meeting will take place in the Newman Institute in Ballina and will run from 11.30am to 1pm. For more information contact Barbara on (096 ) 80451, Niamh on (094 ) 9049342, or Ailish on (094 ) 9049172. Swinford Tidy Towns 2015 Clean Street League Awards night will take place this evening, October 23, at 10pm in the Gateway Hotel Swinford. Results to date can be viewed at www.swinfordtidytowns.com Make sure to go along on the night and find out who this year's winners are. Music on the night will be provided by Tempo Country. Swinford Camera Club meetings have resumed for the 2015/16 season. Meetings are held every first and third Wednesday at 8pm in the Gateway Hotel. A meditation programme commences in Ballina Family Resource Centre on Tuesday October 6 and will run from 10.30am to 11.30am for five weeks. Mayo Cancer Support Association is running this programme, numbers are limited so book your place with Annie /Jean on (087 ) 2804164. Mayo Historical and Archaeological Society. On Wednesday evening next October 28 the first lecture in the new series of lectures for 2015/16 will be held in GMIT Castlebar Campus at 8pm sharp in conjunction with the Heritage Deparment in GMIT, Castlebar. The first lecture will be by Michael Gibbons on the topic of The Pilgrimage Islands off The West Coast of Ireland. The annual Halloween market is on at the amenity centre in Mulranny on Sunday October 25 from 12 noon to 4pm. Go along and enjoy the wide variety of art, craft, and food stalls, children's activity table, coffee shop, plus Halloween treats for children too. It's a great day for all the family. Claremorris Macra is holding its next meeting on Friday October 23 at 9pm in Maxwells, Claremorris. New members are always welcome. Christmas party and other items will be discussed. Membership is just €25 for first time members. Garrymore GAA Club is holding a special night of recognition tomorrow, October 24, at 8pm in Garrymore Community Centre to honour the Garrymore intermediate team of 1965. Special guest on the night is Jim Fleming, Mayo GAA president. There will also be presentations to the current Garrymore senior team. A introductory course called Change your posture - Change your life with the Alexander Technique will take place on Saturday October 31 in Castlebar Library from 11am to 12 noon. The introductory course will be followed by a six week training course in the Reflection Centre, Westport Road, Castlebar. For more information call Michaela Wohlgemuth on (087 ) 7556558. A Halloween ball in aid of Mayo Roscommon Hospice palliative care service will take place in the community centre Killala on Saturday October 31 commencing at 9pm. The event includes a monster wars laser tag maze costing €2 per person. Music will commence at 9pm, with prizes for the best costume. Tickets cost €10 per person or €5 for students. For more information call (094 ) 9388666. A new Rainbows programme for children aged seven to 18 years who have experienced loss in their lives through either the separation of their parents or the death of somebody they were close to is starting in the Family Centre, Chapel Street, Castlebar, on Wednesday November 4 at 6.30pm. Early booking is essential. Belleek Castle will be holding "Spooky Tours" in the castle that will include some ghost stories about Belleek Castle from the past and also include the museum castle tour, finishing off in the dungeon. The dungeon will be decorated in a Halloween theme for the week from Monday October 26 to Saturday October 31. The hotel may be closed for some private events during the holidays so it is advisable to call ahead to ensure a tour is available. The Croagh Patrick Heritage Trail is hosting a nature walk with the help of a National Parks and Wildlife Service expert tomorrow October 24 in Brackloon Wood at 11am. There will be a cover charge of €5 and the day will include a guided walk with tree and wildlife identification. All ages are welcome, just wear something warm with comfortable footwear. Brackloon Wood is situated 5km outside Westport on the Leenane road. Turn right just past Knappagh at the signpost for Owenwee. The wood is situated 250 metres along the Owenwee road. There is parking at Brackloon School, just past the entrance to the wood. For further details contact Greg or Willy at Clogher Heritage Centre (094 ) 9030687 or email [email protected]. Parke Arts and Drama Group and Parke Community Hall Committee are jointly hosting a quiz night in The Turlough Inn this evening October 23 at 9.30pm. Tables of four cost €40. A great night of fun and facts is in store. Go along with family and friends to support these local organisations. A Halloween cookie and cupcake workshop for children aged from eight to 12 years will take place in Ballina FRC on Thursday October 29 from 10am to 2pm. For more information contact (086 ) 0842546. Davitt College in Castlebar is hosting a charity fundraising night 'Buy My Style' on Friday November 6 in Davitt College from 6pm to 9pm. The funds raised will go towards the Melissa Patterson memorial fund, the organisers are asking for people to donate new or nearly new designer and occasion dresses, shoes, coats, handbags and jewellery for the sale. Today is the last day to drop off items for the fundraiser at Davitt College sports hall. Ballina is hosting, for the first time, a one act drama festival, at Ballina Arts Centre which will run from Friday November 6 to Sunday November 8. Aughalasheen NS will hold a 25 Card Game Drive in the Broadhaven Bay Hotel this evening October 23 starting at 8pm. Tickets will be on sale from parents, staff, board members, and by calling the school on (097 ) 82340. You do not need to have a ticket, go along on the night and you can pay on the door.